After today's visit to Penshaw Monument I was back in the car and off to the Angel Of The North, another of the North-East's most recognised landmarks. By the time I'd made the fifteen minute journey the rain had passed and I was able to take a few more photographs under fairly cloudy skies. Once again, the Angel is another local icon that I've photographed on numerous occasions. As it is situated next to the A1(M) it is seen by thousands of motorists every day, with a fair few of them stopping off to get a closer look. Today there was the usual scattering of visitors who were all keen to get photographs before they left. I was only here for a few minutes before making my way back to Houghton-Le-Spring. Maybe Gateshead Council should consider lighting the Angel up at night. What a sight that would be! Penshaw Monument stands on the top of Penshaw Hill on the outskirts of Sunderland. 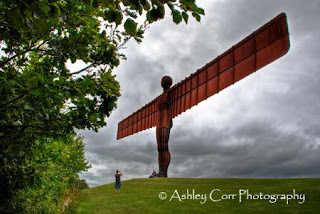 It can be seen for miles around and is one of the North East's best known landmarks. It was built in 1844 and is located about three miles north-by-east of Houghton-Le-Spring, and "derives its name from the British Pen and the Saxon Shaw, a wood or thicket; thus Penshaw is the wooded hill." On the top of a lofty eminence, called Painshaw Hill, is a Grecian monument, erected to the memory of the late Right Hon. John Lambton. I must have photographed this local icon hundreds of times, mostly at night when it is illuminated by powerful lights. As Penshaw Monument is Sunderland's most famous landmark I decided to use my photographs of it on business cards, invoices etc. It has been my logo since 2003 and will remain so for many years to come. 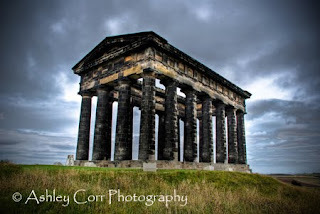 Today it was quite windy at the summit of Penshaw Hill. There were a few people about but I managed to get some shots when they disappeared round the back of the monument. The dark clouds above suggested rain was on its way and within a few minutes it came down quite heavily. It's been at least a month since I was here for some night photography - I'll get myself back up there soon and let you know how I got on. Thanks. I'd only previously visited Hartlepool on one occasion, to watch a pre-season friendly at the Victoria Ground against my team - Sunderland. 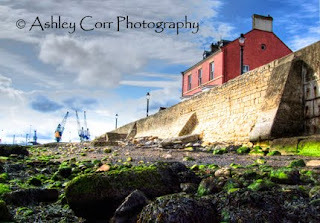 Today my wife went shopping so me and my son, Christopher, visited the Museum Of Hartlepool on the historic quay. It wasn't half windy - lost me cap on more than one occasion, much to the amusement of the little fella. After our museum visit we headed for the Headland, a few minutes drive away. I parked up and we went onto the sand and mucked about for half an hour, looking into the rock pool s for any sign of life. Nothing. 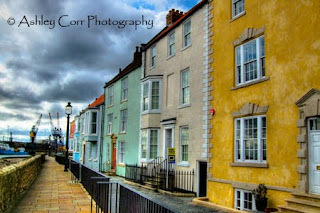 The multi-coloured houses that overlook the harbour draw you in. Each one rendered in a different colour finish. They were just waiting to be photographed. These shots were taken with a Fuji compact, hand-held. 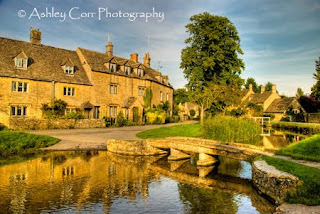 Lower Slaughter - not a very pleasant name eh? This place definitely takes some beating. I thought I'd seen the best of it in Cornwall, but clearly not, as Lower Slaughter was the most picturesque of all the places I'd visited during my week's holiday. Similar to Bourton up the road, this was a very quiet village and very much 'off the beaten track'. Whilst looking at some postcards in a 'Bourton' gift shop, I happened to notice a sketch which was labelled 'Lower Slaughter'. It looked like something from an old film, but as it had caught my eye I remembered the name as we drove from Bourton to Stow-On-The-Wold. I had taken a wrong turn and headed up a country lane so I could do a u-turn and head back off to 'Stow', our original destination. It was along this country lane that I noticed a signpost that read 'Lower Slaughter' so ahead we went and there it was. We parked up next to St Anne's church and made our way across the road to the main street which was divided by the River Eye. The place was spotless. Again, very quiet with the odd person walking a dog here and there. All we could hear was the trickle of the water and the bird song. The sun was quite low and it shone against the houses next to the river. We sat for a while and took it all in. My camera got some stick mind, aye, there was no stopping the shutter! Even the ducks posed nicely before we headed on our way and off to Stow-On-The-Wold. It doesn't get much better than this! 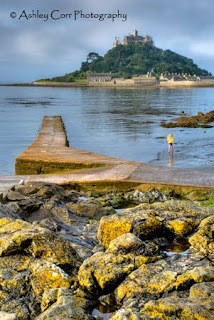 I awoke at 7.00am for an early morning visit to St Michael's Mount near the small town of Marazion. The weather forecasters had predicted that today would be hot and sunny with a scattering of fluffy clouds. Sounded good to me - ideal for those picture postcard shots that I was after. I was literally up and out the door with my kit and as I only had a couple of hours to spare I was going to make the most of it. A quick stop off at the McDonalds drive-thru had me sorted in the shape of a bacon & egg McMuffin washed down with a coffee. I polished them off as I drove to St Michael's Mount and after parking up in nearby Marazion, I was now ready to grab some shots. 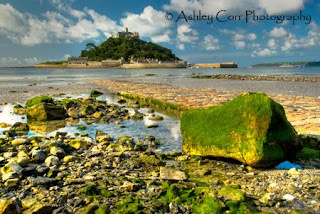 The tide was retreating and the cobbled causeway to St Michael's was becoming more visible. I set up the tripod and perched my camera on it before getting to grips with the required settings. I had the sun behind me and a beautiful view in front - couldn't ask for more really. During the time I was there the fluffy clouds eventually showed up and I made the most of my opportunity. St Ives is the most famous of Cornish holiday towns. It was only 15 minutes drive from our base in Hayle, so I made a few visits to photograph it during the day and night. The harbour and beach are by far the most photogenic areas of St Ives and and they proved very popular during my visits. Along the promenade there were the usual gift shops, pubs and restaurants as well as art galleries. 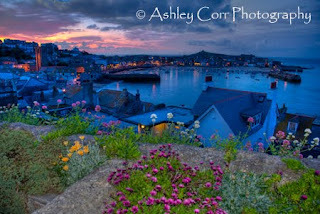 The photograph above was taken shortly after sunset as I overlooked St Ives from a nice vantage point. It was a lovely summers night, no breeze, very little noise, just right for some night-time photography before heading back to the car. Job done. One of the most popular places in Cornwall, the village of Polperro is undoubtedly one of the prettiest. Packed tightly into a steep valley on either side of the River Pol, the quaint colour-washed cottages and twisting streets offer surprises at every turn: the Saxon and Roman bridges, the famous House on Props, the old Watch House, the fish quay, and a photography gallery. With its protected inner harbour full of colourful boats. Polperro is still a working fishing village, although tourism provides the main source of income. Attractions include a Museum of Smuggling and a Model Village. Of all the and villages towns I visited in Cornwall, Polperro was my favourite. It's a place that is full of character and is almost lost in time. A photographers dream. It was a pity that the tide was out and the tethered boats were on dry dock - a still river would have finished the photographs off well, but it wasn't to be. I stumbled across a photography gallery and popped inside to view the canvasses on display. It was a surreal moment as I felt a sense of familiarity with the place. Surely I'd been here before. No, impossible - this was my first ever visit to Cornwall. Then, as I admired the stunning landscape photography on display, I noticed many of the exhibits were the work of a certain Helen Dixon. Then it suddenly dawned on me, as I realized I had recently read an article about Helen and her work in a photography magazine. I remembered specifics from the acticle in question and how it said Helen's work was on display in 2 galleries in Cornwall. I was now standing in one of them. The magazine feature, on Helen's rise to fame in the photography world, also showed a photo of the gallery interior. My sense of deja-vu as I entered the gallery obviously stemmed from this photo. I've got to say though, her work is on par with the standard that Joe Cornish regularly delivers, and he takes some beating. Not bad at all when you consider Helen Dixon only took up photography as a hobby just a couple of years ago. 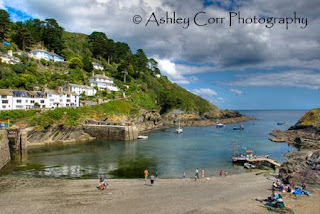 When I return to Cornwall I'll make sure Polperro is top of the list when it comes to photography. I'll be sure to check the tide tables too. This was an unforgettable visit. In medieval times there were two towns on opposite banks of the River Looe. 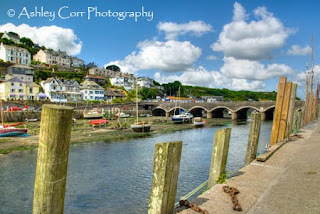 West Looe includes the fishing harbour, the main shopping centre and the sandiest beach. East Looe is quieter, but also has shops, restaurants and hotels and leads to Hannafore with its fine views of Looe Island. The two towns are joined together by a bridge across the river. My port of call was West Looe. The weather was very kind, with soaring temperatures that ensured the beach was packed and landscape photography in these conditions were going to bring the best out of this lovely town. I walked through the very busy shopping centre on route to the beach before taking more photographs at the fish quay that overlooked the Looe bridge during low tide. The journey from base to Looe was over 50 miles but well worth the effort. Next stop - Polperro. Destination - Cornwall, and a rather hefty drive. 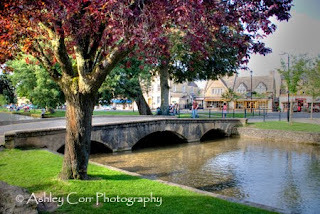 I didn't fancy doing Houghton to Cornwall in one go so the trip was split in two parts, with an overnight stay in Bath. Once again my travels had taken me to another place that I'd never previously visited and although I only saw the city centre, it was another lovely place that I enjoyed. It was early evening when we arrived and the overcast conditions weren't ideal for photography, so I didn't devote much time to it, opting for a bar meal and a nice cold pint instead. And why not - the week ahead would surely present plenty of photography opportunities, so there was no hurry. The centre of Bath is an interesting place. 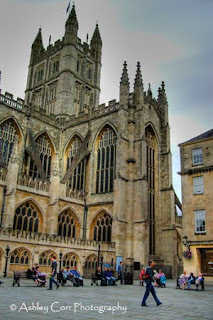 Lots of historical interest in the architecture, especially the Abbey, Roman Baths and the picturesque Circus (pictured above). As well as the usual 'Run of the mill' city centre shops, there were lots of designer and antique outlets plus a good range of pubs and restaurants. Quite a few people had gathered next to the cathedral as a busker played ballads on an acoustic guitar. He was rather good. My son suggested we should buy his £8 cd, which was on display next to his guitar case, until I said to him 'Well, he's not THAT good' he he. 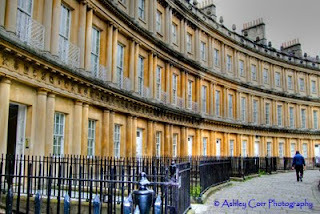 One place that we never got to see was the Royal Crescent. I'd seen plenty photographs of it in the past and no doubt a visit would have provided me with a few of my own, so maybe next time. Yes, another lovely place, one which will be revisited whenever I'm in the area next.